Former world heavyweight champion David Haye knocked fellow Briton Dereck Chisora to the canvas twice in the fifth round to win their grudge match in pouring rain at Upton Park in east London over the weekend. The pair was involved in an ugly brawl at a news conference in Munich last February following Chisora’s defeat by WBC heavyweight champion Vitali Klitschko. The pair traded blows in a lively opening four rounds with Haye shading Chisora on points after landing a ferocious uppercut in the fourth. In the fifth round, the former world cruiserweight champion unleashed a devastating left-right combination in the space of 10 seconds to win by a knockout. The fight at the home of English Premier League football club West Ham United for the WBO and WBA international heavyweight titles had been sanctioned by the Luxembourg Boxing Federation as the British Boxing Board of Control would not sanction the fight because neither boxer held a British license. 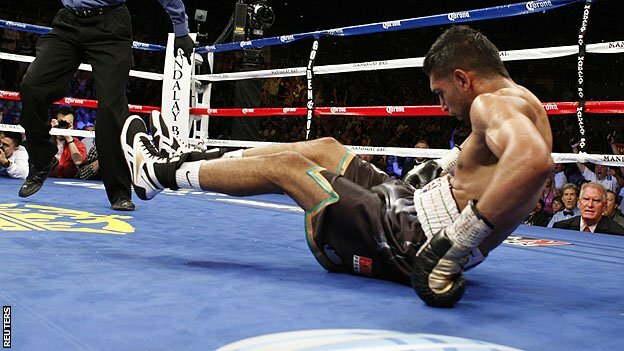 In other boxing bout, Amir Khan suffered his second successive defeat as he was stopped in round four by unbeaten American Danny Garcia in Las Vegas. Khan was knocked down three times as Garcia claimed the British fighter's WBA light-welterweight belt and held on to his WBC title. 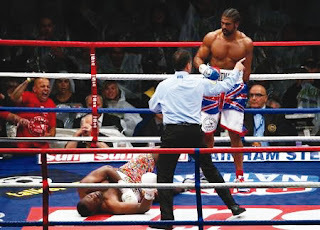 After a strong start, Khan was floored in the third by a counter and could not recover from shots in round four. Khan is now 26-3 with 18 early wins and two stoppage defeats, while Garcia is now 24-0 with 15 knockouts.